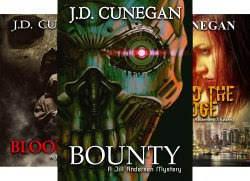 We welcome JD Cunegan to the blog – to chat about his Jill Andersen mysteries, superheroes, murder mysteries – and the odd bit of NASCAR. Hi, JD, and welcome to Altered Instinct. I think it would be fair to say that your Jill Andersen mysteries are your calling card – combining superheroes and murder mystery. What brought those two together in your mind? Jill’s origin dates all the way back to a now-defunct comic book series that debuted when I was in high school called Witchblade. It starred NYPD homicide detective Sara Pezzini, who was chosen as the host for a mystical gauntlet called the Witchblade. I liked the idea of a cop as a superhero, an interesting dichotomy for me to play with as a writer. So from there, Jill was born. Ahh Witchblade, loved that - always wished it had gone on longer! So Jill is a military veteran, a police officer and... a full-on cyborg. Where did she spring from as a character, and what do you most love about writing her? I wanted Jill to have actual superpowers, but the supernatural/fantasy element didn’t quite fit with what I was going for. By giving her the military background, that opened the door for me to introduce the cybernetics. The conspiracy behind that, which is somewhat reminiscent of the Weapon X project that gave Wolverine his adamantium skeleton, was touched on in Bounty and will be re-visited in a major way in coming novels. There's two books in the series so far – with the second book delving into the family history of Jill. Are there more brewing, and where does Jill go from here? I’m currently putting the finishing touches on Behind the Badge, which will be the third novel in the series. It’s currently set for a June 1 release, and it puts Jill in the awkward position of solving a murder that winds up being a case of police brutality. It’s the first time I’m sort of ripping a plotline out of the headlines, but it felt like the sort of story I had to write. It will probably rub some people the wrong way, but it will shift directly into the fourth book, Behind the Mask, which will release in January and will change the face of the series forever. Now, I understand you're quite the fan of Castle. And that in your fantasy casting of Jill Andersen, Stana Katic would be right up there. I'll make a confession here – not living in the US and with streaming versions of Castle (I think on Amazon) not being available here, I've actually seen very little Castle... (pause while I wait for the gasp of horror) so what is it about Katic that makes you see her fitting the Jill Andersen role? When I started watching Castle, which is constantly being shown in syndication now on one of our cable channels, I quickly noticed that Katic’s character – Detective Kate Beckett – shared a lot of similarities with Jill. Their sensibilities as a cop were almost identical, and I liked that Beckett had the same soft side I wanted Jill to have. I didn’t want Jill to be the stereotypical Strong Female Character ™, so stumbling upon Katic’s most famous role gave me a better idea of how to strike that balance, and it really inspired me to sit down and finally finish the first novel. At the risk of typecasting, I would love for Katic to take on the role on the off-chance my work ever wound up on the screen. I should explain this chat is way, way overdue as we've both been fiendishly busy. What have you been working on lately that's been keeping you so hard at work? Well, there’s my day job; I work in collegiate athletics, which keeps me beyond busy from September through March every year. 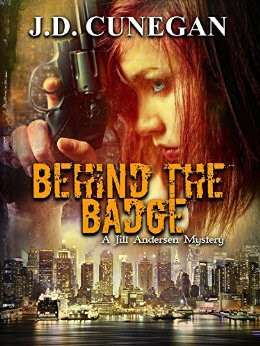 On top of that, I’ve been writing and editing the next two books in the Jill Andersen series – Behind the Badge and Behind the Mask – as well as working on two separate novels: Notna, a supernatural/fantasy epic that will probably wind up being the longest novel I’ve ever written, and The Pen is Mighty, a first-person political thriller that’s unlike anything I’ve ever tackled. Away from the Jill Andersen books, let's talk about that supernatural fantasy book in the works – Notna, which you say is steeped in comic book lore. Tell us a little about that and how it is influenced by comic traditions. I actually created Notna before I created Bounty, way back when I was in high school. Those two have always been my pet projects, even when I switched from wanting to be a comic book writer and artist to simply writing novels. My writing far out-classed my art over the years, and it’s been interesting to see how something I original created for panels and word balloons has made the transition to prose. Notna is full of prophecies and high fantasy and gods and monsters and… for as much as comic books have influenced its creation, I would be remiss if I didn’t also credit the TV shows Buffy the Vampire Slayer and Angel for their influence as well. That's due out next year, I believe? How far along is it in production? I’m roughly 30 percent done with the first draft; if all goes to plan, Notna will be out in late 2017. Talking about comic lore – what are your influences there? I was a Marvel kid growing up; if it wasn’t Marvel (or, more specifically, X-Men), it didn’t hold my interest. But as I got older, my tastes began to vary, and I became more willing to try new things. One of my favorite things about comic books has always been how the medium pulled off the massive, multi-chapter storylines that spanned over multiple titles. Age of Apocalypse and Civil War are among my favorite such storylines, and I loved the beginning of Top Cow’s Artifacts because of the world-building and the lore it established. The way the medium combines the mundane (like, say, homicide cop) with the fantastic (like, say, cybernetic implants) has always fascinated me and colored my writing. A quick word about your covers – I really like the covers for Blood Ties and Notna - while the Behind The Badge cover is, no word of a lie, awesome. Not to say I don't like the ones for Bounty and Boundless, but I think as your books have progressed, the covers look more polished. Do you do your own covers or is there an artist that you make use of? If so, how did you find them and what was that experience like? Covers have definitely been a learning experience for me. When I first published Bounty, I put almost no effort in the cover; it was an afterthought. My sales reflected that. The current cover for Bounty is the third one for that book. Because of my relatively limited budget, I get my covers from SelfPubBookCovers.com; they’re premade, but I’ve been incredibly fortunate to find covers that match what I’m writing. Boundless was a cover I created on my own, thinking I could rely on my art skills to create something. Let’s just say that, for the time being, I’ll be sticking with that website. You get to go for pizza with one of your characters – who do you choose and why? Detective Earl Stevens (a side character who debuted in Blood Ties)… because writing his dialogue is some of the most fun I’ve ever had as a writer. There’s no telling what’s gonna come out of his mouth at any point, and I bet he’d have some really funny stories from his days playing college football at Nebraska. Away from books for a moment, you're a self-confessed sports nut – and I think anyone following you on Twitter would be in no doubt about that! NASCAR, I believe, is your obsession of choice – how often do you get to live events? Or with racing do you prefer it on TV to get the overview of the whole thing? I go to about five races a year, and like I always tell people who say they don’t get what the big deal is with NASCAR – you have to be there to truly get the experience. TV only gives you so much; unless you’re standing there, feet away from the cars as they roar by at full speed, taking in the sights and the smells and the sounds, you’re not gonna see the allure. I don't know if it's even possible to try to sum this up – I'm a football (as in soccer) fan and I would struggle to describe the passion and despair that comes with that – but why does NASCAR draw you in so much? The intensity and the passion of it all. That’s true for every sport, but the passion surrounding motorsports is palpable. You can feel it even when you’re walking around the merchandise displays outside the track. The tension leading up to the moment the race starts is thick, and once the race itself starts, there’s a constant air of anticipation – because you never know what’s going to happen, and you never know when. You can’t blink or turn away, because everything can change with a snap of the fingers. Who are you tipping to win the Sprint Cup? I think Kevin Harvick will win his second title in three years. He’s too fast, week in and week out, to not be considered the favorite. Back on the books front – which is most useful to you to promote the book, Facebook, Twitter or Goodreads? Or some other social media? To this point, Twitter and Goodreads have been my most reliable online outlets. 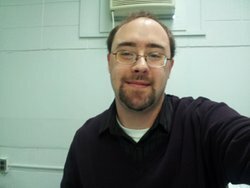 Facebook has been great for connecting with other authors, but it hasn’t given me the exposure or sales results that the other two sites have. I also have a presence on Tumblr, but to this point, that hasn’t done much for me. You get stuck on an island and you only had one book you packed in your travel bag before the ship went down. What book do you hope you have in there? Harry Potter and the Deathly Hallows… because it’s the only one in that series I haven’t read yet, and I keep putting it off and putting it off. Maybe having it on the island will be the push that finally makes me sit down and read it. OK, last question here is traditionally a double question – what's the best book you've read in the past year and what are you reading currently? R.R. Virdi’s Grave Measures tops the list of some incredibly books I’ve read over the past 12 months; the follow-up to Grave Beginnings was fantastic, and I think anyone who hasn’t read Virdi’s books yet is really missing out. I’m currently reading Armada by Ernest Cline and Skeins Unfurled by K.M. Venderbilt. JD, many thanks – and best of luck with Behind The Badge and Notna! JD Cunegan's books are available on Amazon here. You can follow him on Twitter - and hear that NASCAR obsession! - here. I loved this interview...you asked some great questions and kept it entertaining!! I am definitely going to check out the Jill Andersen Mysteries! !